SSCS provides backoffice software solutions for c-stores, conventional stations, self-serve stations, car washes, auto repair, towing operations and fuel marketers. Chewy at the keyboard working on answers to the questions we sent him. 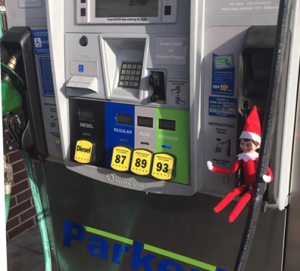 Two things this blog loves are Christmas and C-store mascots, which is why we are delighted to have Chewy the Parker’s Elf participate in this installment of the SSCS interview. Chewy is the first mascot we have ever tracked down and we are pleased to say he was extremely accommodating given his busy holiday schedule as a representative of Savannah-based Parker’s, a multi-site operation with 36 C-stores throughout Georgia and South Carolina. (For more information on the company and its “Fueling the Community” program that gives back to the communities it serves, please visit http://parkersav.com/Home.) One more thing before we get started: If you are a C-store company that would like us to consider interviewing your mascot, please send us a private message on Twitter (we’re SSCS, Inc., or in Twitter parlance, @sscsinc). SSCS: Hi, Chewy. We’re a little nervous because we’ve never interviewed an elf before and the ones in the “The Lord of the Rings” and the “The Hobbit” look pretty full of themselves. So go easy on us. Chewy: Don’t worry. I’m a Christmas elf and we’re very friendly. Anyway, and since you brought it up, I feel those movies in general misrepresent all elfkind. But that’s just my opinion. SSCS: So where do you live? Chewy basking in some sweet Savannah sunshine. Chewy: I’m from the North Pole, but I’m really not fond of the bitter winter chill, so the appeal of the warmer temperatures, delicious food, and friendly people of Savannah, Georgia brought me to the South. Hey, y’all! SSCS: “Hey” to “y’all”, too. Before you worked for Parker’s what did you do? Chewy: I worked in quality control at a candy factory, but I soon realized I craved the spotlight. I landed a few background roles in some holiday TV specials, but I needed a larger audience. At Parker’s, the entire month of December is all about Chewy! They really let me shine. SSCS: Take us through your typical day at Parker’s. Chewy: I wake up around 6:00 a.m., snuggled up among the warm breakfast biscuits. I then drink an entire pot of coffee because taking all these selfies requires a lot of energy. [Chewy fans can catch his selfies on Twitter (@ParkersPumpPal) or on Facebook (http://facebook.com/parkersav) — Ed.] I spend the morning eating candy and throwing tinsel around the store. I always stop to take a photo with a fan. Around noon I take a nice long nap in the Chewy Ice because it reminds me of home. By late afternoon I’m ready to party! That’s when I take all my best selfies. I eat some more candy, and relax with some hot chocolate before bed. It’s not easy being a celebrity, you know? SSCS: High carb diet, I see. You must have a metabolism like a hummingbird. Anyway, why do you think Parker’s hired you? What were your qualifications? Chewy: Ha, ha. They didn’t really “hire” me, I just showed up. Persistence is the path to success, and charm. I’m very charming. I’m sure you’ve noticed. SSCS: Err…um…okay, yeah, sure. So…what’s the best part of your job? Chewy: Oh, where to begin! Well…have you ever had a biscuit as a pillow? Talk about amazing! And our customers! I love interacting with Parker’s customers! There’s so many of them, and they’re all really cool. And whenever I need a drink—we have hot chocolate on tap! What could be better than that?! SSCS: And the most challenging part of your job? 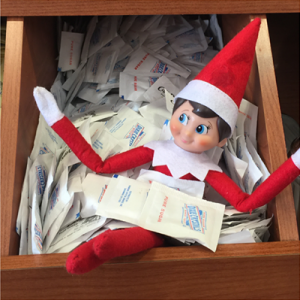 The carb-crazy elf gets loose in the sugar drawer. Chewy: Decorating an entire convenience store with Christmas lights when you’re eight inches tall isn’t as easy as it sounds. 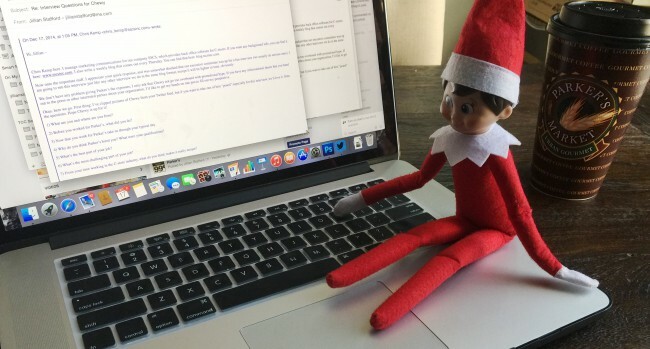 Christmas Magic can only get an elf so far. SSCS: And we thought we had problems. Okay, last one: From your time working in the C-store industry, what do you think makes it really unique? Chewy: Working in the C-store industry is great! It’s unique because we see so many of the same great customers every day. I watch employees form friendships with our repeat customers, and make connections with new ones all day long. We have the pleasure of taking a customer’s basic trip to a convenience store and turning it into a journey that results in meaningful interaction. SSCS: Well, thank you for your time, and happy holidays to the Parker’s family from SSCS, Inc. Chewy: Same to you, and if I see Santa I’ll make sure I’ll put in a good word for the SSCS team. Now where did I leave that cup of hot chocolate…?